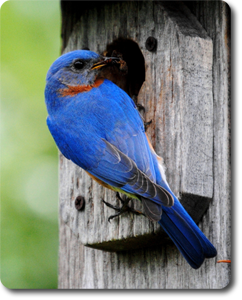 "The Sky On His Back" My favorite bird of all is the Eastern Bluebird! He carries the Promise of Spring with him all year long and seeing him on a cold winter day makes you feel warm inside. The Bird of Heaven and Earth! He is Forever April and blooming Apple trees and He is a living,breathing fairytale in the form of such a special All American Treasure. Captured behind my home on Bluebird Ridge in Eastern Daviess County, Kentucky.